Susan Rogan has over 20 years experience in the entertainment and beauty industry as a professional makeup and effects artist in the Chicagoland area. 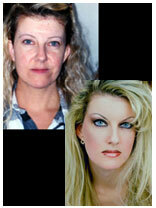 Being a certified air brush artist, she specializes in body art, air tanning and makeup application. She has worked on a variety of projects including fashion shows, the Joffrey Ballet, Harpers' Baazar, Matrix, "Why Me" Cancer Survivor Events and applying makeup for an episode of Bridezilla (June 2005). Often her work takes her on location for the numerous wedding parties and events within and outside the U.S. Her 12 years experience as a makeup artist and trainer for Estée Lauder has given her the expertise to create any style you are looking for. Whether her work takes her on location for a catalog photo shoot, or backstage of a runway for a fashion show or to a bride's house, Susan demonstrates her talent and desire to create a flawless style to enhance the subject. Please view the various portfolios for a few examples of her work.